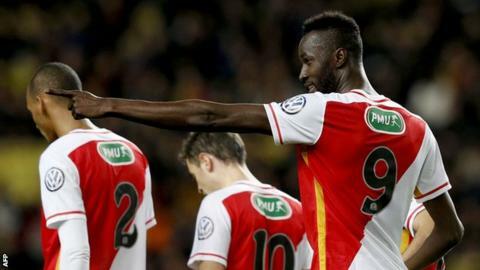 Lacina Traore scored four first-half goals before being sent off as Monaco beat amateurs St Jean Beaulieu 10-2 in the round of 64 of the French Cup. The 6ft 8in ex-Everton striker, 25, was shown red at the break following an altercation with Yann Mariotti, who was also dismissed. Andrea Raggi, Fabinho (two penalties), Helder Costa, Fares Bahlouli, and Mario Pasalic scored the other Monaco goals. Arthur Leblanc and Faycal Sahour (penalty) netted for the away side. Ivory Coast international Traore joined Everton on loan in January 2014 and made two appearances for the club that season, scoring on his debut against Swansea before suffering a leg injury.